AnonD-81417, 15 Mar 2013Agree...current S4 design just awful..looks like cheap China made junk to me.But you must admit... no matter the design you would have said it looked cheap and junk. Personally it looks great, the xperia z is too square, ditto the plactic brick nokias, iphones look like a remote control and htc's aren't that exciting... I GUESS THE SALES NUMBERS WILL TELL WHO IS RIGHT. Impressive screen and hardware packed into this S4. But the gesture function is kinda over the head, who would really use it? Uses a lot more energy than clicking a button on the screen or a swipe of a finger. This gesture function means u have to either use two hands or have the phone laid down on the table. Not particularly impressive. The looks, i wud say too similar to S3. Otherwise, everything else quite competitive with other brands. 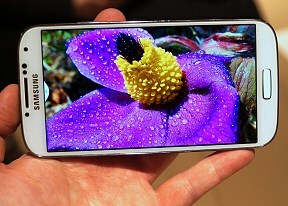 From these first previews or hands-on... things, Galaxy S IV = HTC + LG + NOKIA features. I'll give Samsung credit for incorporating all those features into one product but do not mention inovation or originality. It is just another phone and some people over-rate it. Better design and super smart phone.The best in the world. It's clear the iPhoners are orphans of their own last hope. Captives of their own superiority. Trapped between dreamy and delusional. They so much desire to be on top but they don't even come close. You prayed for a bad Galaxy S IV, and here is your answer. But caaaaa........nnnn you HANDLE IT? I think the main selling point of the Samsung flagship phones compared to the rest is that they will keep the phone up to date with the latest Android version for 2 years which is pretty much the life span of the phone. HTC and Sony are awful at updating their phones. I think the S4 is aimed at people who had the S2 not the S3 as there is still another year of life in that phone. Adrian, 15 Mar 2013Big and ugly.The only ugly thing is Lumia that cheap plastic with no apps or games even their specs is so outdated. Look how it creeks just by touching it! While SIV is the star look how many interests are! Finally, the IR port in mobile phones is making a big comeback. Whoever decided for this to be obsolete a few years back should burn in hell for eternity constantly munching on his own putrid feces, human-centipede style! How smart is a smartphone you can't use in place of a standard TV remote? My extremely old Nokia had that feature and my even older Casio watch! Just retreat under your miserable iPhone tree. I have a s3 but this is brilliant. Loads of new features and the extra storage of removable micro SD composted to its rivals. I am sure this will sell like hot cakes and be the best selling smartphone when it is available at the stores. My only gripe is I am not due for an upgrade on my contract yet. Those shots taken with the S4 are more than decent. The only thing I kind of missed was benchmarks (quadrant, antutu, sunspider, glbenchmark and the works). Great that you'll be able to use the phone with gloves on! The software features alone easily trump the competition, and adding even more amazing specifications on top of that, Samsung has a real winner on their hands. The quad-A15, coupled with 2Gb ddr3 and SGX544MP3 at 533mhz, is just yummy. Feel bad for the people in the US that are getting the s600, which isn't a bad SoC per se, but you cannot really compare the Adreno 320 to the SGX544MP3. Looking forward to seeing more detailed reviews in the coming weeks! AnonD-16443, 15 Mar 2013I was impressed with processor spec of S4. But for my next smartphone, I still consider either... moreAgree...current S4 design just awful..looks like cheap China made junk to me. AnonD-80307, 15 Mar 2013OK I waited for nothing, my choice is Xperia ZL.Yea..lame design although nice air gesture...the design should drastic improved such as HTC One or XperiaZ..now that what we called innovative. Madman, 15 Mar 2013Cheap plastic, again... C'mon. You're not making a washing machine, Samsung! Give more premium... moreJust retreate under your miserable iphone Tree. OK I waited for nothing, my choice is Xperia ZL. Never been much of a Galaxy fan but I have to applaud Samsung for managing to squeeze such a big screen and features into a body smaller than the S3.